The AX2005/A is a high voltage step-down converter designed for driving up to 10 series white LEDs from a 40V system input. The total LED driving current up to 3A (AX2005) / 2A(AX2005A), which is measured through an external current sense resistor. Its low 200mV feedback voltage reduces power loss and improves efficiency. 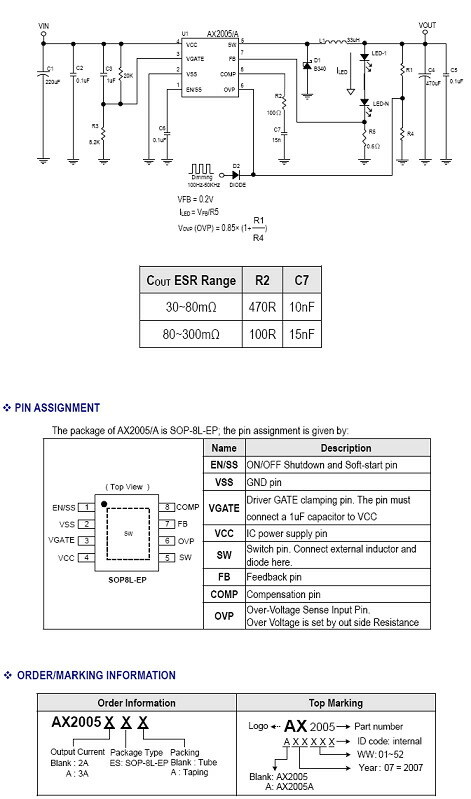 The OVP pin monitors the output voltage and turns off the converter if an over-voltage condition is present due to an open circuit condition. The AX2005 includes current limit, short circuit protection and thermal shutdown protection preventing damage. AX2005/A provides high power, high efficiency, and excellent transient characteristics.The PWM control circuit is able to the duty ratio linearly from 0 up to 100%. Since this converter can accommodate an input voltage up to 40V, it is also suitable for the operation via an AC adapter. - Enable/Disable function with soft start time control. - Current Limit (CL), Thermal Shutdown and Short Circuit Protections (SCP).